High Quality! !Gold Can last long time!! Ring is is adjustable, do not worry about the size!! 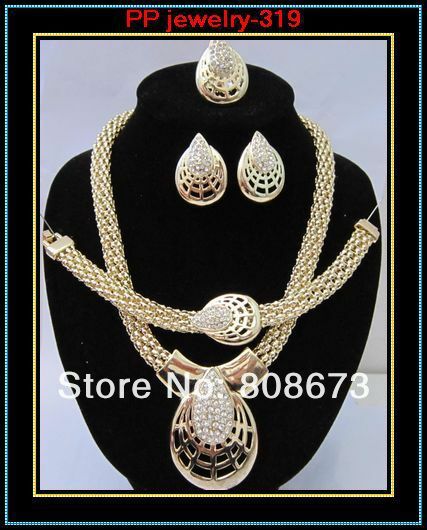 We have specialized in Jewelry set for many years, our Jewelry is plated by 18K real gold.our quality is good, so do not worry about the quality. 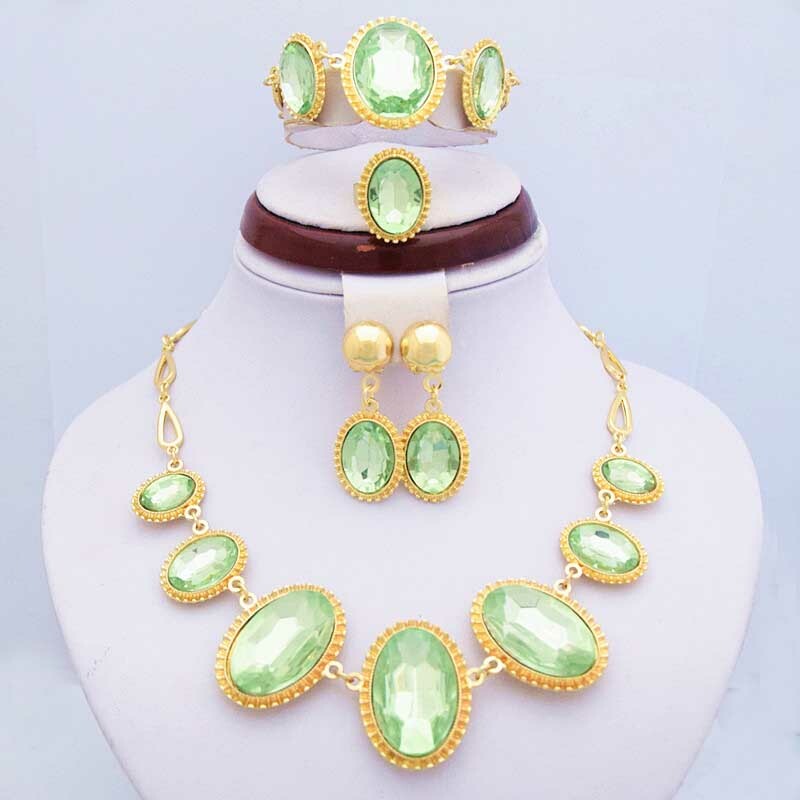 We have a professional design team, we can offer the most fashionable and newest Jewelry. 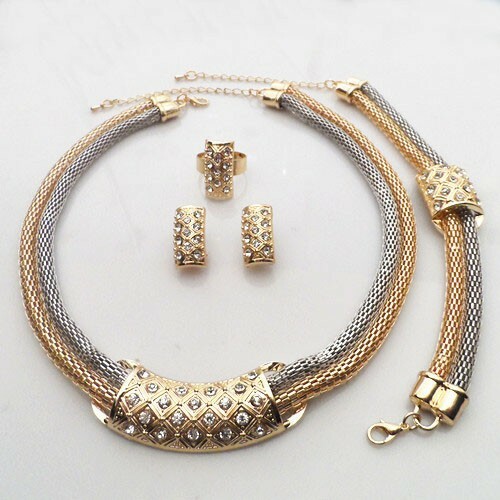 All of our jewelry is Nickel-free, lead-free. Shipping-Very important Please read carefully!! 1). China post air mail, free shipping,but it needs about 15-45 days to arrive( maybe longer according to different places or conditions! )Please wait patiently before receiving the parcel. Thanks so much for your cooepration!!! 2). Express:DHL,UPS,FEDEX,EMS, You can choose in my website, Cause we have offered the most competitive price, you need to pay additional charge for the shipping cost.You will receive the items within 3-7 working days after we send them(for the quantity is more than 120 pcs, we need about 7 days to produce). If you have any question about the shipping methods,please feel free contact us!! Put the earring, necklace, bracelet and ring separately into the opp bag. And put the whole set into bubble bag for keeping away from damage. We gurantee you Zero risk shopping here, If the item has some problem, please contact us as you receive it, and offer us more details about the problem, we will resend one or agree to refund after our confirmation. Note: we do not resend for those which have been used. If you have any problem, please feel free to contact me , i will solve the problem.Trust me.Please do not leave negative feedback without contacting us!! thanks for your cooperation! !, i need support from every clients. For the development of our business oversea, welcome the wholsaler to talk the cooperation with us, we can offer you the products with the most competitive price and high quality.If you want to resell our products or have a shop, please contact us asap.We are looking forword to establishing long-term business cooperation with you. Welcome to our store!! We will give you much surprise. Have a happy shoping Journey! !